This is a space battle mini game within The Dark Side. 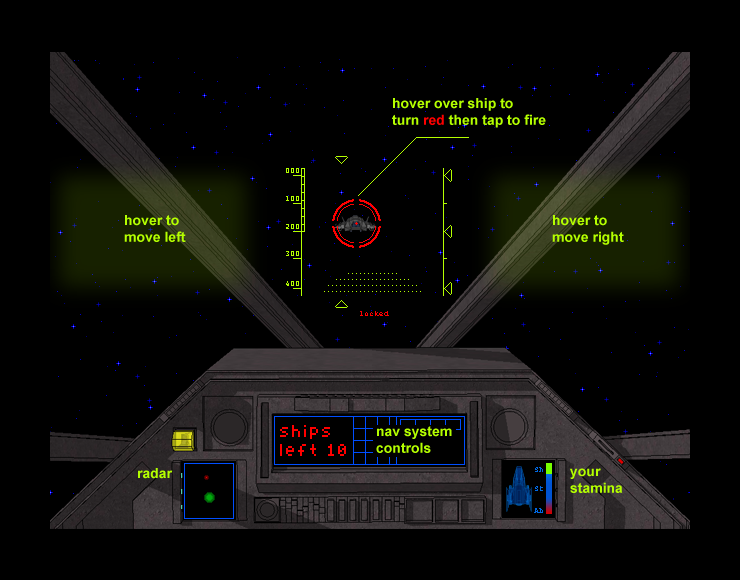 Using a stolen star fighter, you are supposed to blast enemy ships hunting you before you make your great escape. Controls are based on mouse movement, hovering the mouse on either side of the screen to move sideways, then after getting the enemy in the center of the HUD you must immediately move the cursor on him turning into red and locking the target automatically. left-click to fire. Whether it's you or the enemy, a hit reduces the stamina by a random factor until it reaches zero and die. The interface for the weapons system includes a radar showing your ship (green) and the enemy ship (red), your stamina, and the remaining number of enemy ships near you.